I have suffered with severe nausea and indigestion for over 5 months.A gastro infection has triggered an IBS in my system and I have been suffering with multiple attacks since then.I have become depressed and anxious, couldn’t go out and have become non functional.Nothing was helping not even antacids until I tried this little beauty one day out of desperation.It worked like magic.I am feeling better each day. This product is an effective fix for problems to do with gas and gluten which are problems that my husband and daughter both have. These capsules settle their stomachs and they say the relief is almost immediate. I have a very noisy gurgly tummy which can be extremely embarrassing in meetings etc. My GP put me onto De Gas and yes they work most of the time to settle the noise. very good and easy fix. I buy these capsules now and then and I think it is also good to have in your cupboard if you generally get bloating or a gassy stomach often . These tablets are so soft that you can even take them without water. It has a sort of minty sensation about it and it helps reliefs your stomach fairly quickly . The good thing is that I know it is safe and I use it whenever needed . I have issues with gluten and do find that I can get horrible bloating pain when I have eaten any. Codeine usually won’t be enough to make the pain go away however I have found that taking 1-2 of these beauties is enough to make the pain and gas go away quickly. It has a lovely peppermint flavour and is quite inexpensive. They are fantastic to have on hand. 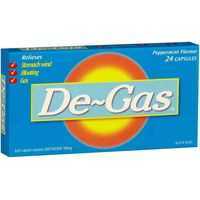 How would you rate De Gas Antacids Gas Capsules?